According to the California DMV, “the greatest risk of traffic crashes is among teenage drivers. Traffic crashes are the leading cause of death for teenagers across the United States.” The tragic death of Fast and Furious star Paul Walker, who lost his life November 30th in a fiery car crash believed to be caused by high-speed driving, has put driving safety in the spotlight. While speeding-related car crashes can happen to any person at any age, teens are perhaps the most at-risk group for car crashes and car deaths. Just as you give children a world of freedom when you hand them their first smartphone, their world expands even more when you give them the keys to a car. Providing this kind of independence is a proud parenting moment – but is also likely the scariest. We like to think – wishfully, perhaps — that our kids are as fearful of the awesome power of “two tons of rolling steel” as we are and therefore drive safely and conscientiously. Realistically, though, teen drivers are beginners, and their lack of experience behind the wheel combined with their undeveloped risk-taking sense can add up to disaster. Whether teens speed to keep up with traffic, because of peer pressure or for the sheer thrill of going fast, recklessly-fast driving can have deadly consequences. According data compiled at TeenDriverSource.org, teen drivers are “more likely than older drivers to speed and to allow shorter headways.” When a teen driver was behind the wheel, speeding was to blame in more than half of the crashes involving fatalities. 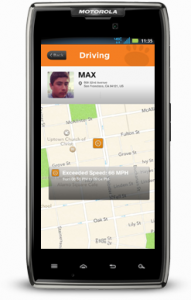 The MamaBear Family Safety App sends parents notifications about how fast their kids are driving or riding and where. This unique feature puts information in the hands of parents and provides kids with freedom to ride with friends or drive themselves but with a little accountability to ensure safety. Giving parents the power of knowledge helps prompt discussion for consequence and safety. These necessary conversations can plant a seed of awareness in your teen’s mind that might curb dangerous future behavior, as well as how to stand up for what’s right in the face of peer pressure.